As an integral member of the Temple Terrace Police Department, Officer Nabil El Mehdaoui faithfully serves the citizens of Temple Terrace in the department’s Patrol Division. Officer El Mehdaoui has been a major contributor to the department’s successful traffic safety and crime prevention initiatives. In 2014, he issued 161 traffic citations and 397 written warnings, and provided 60 Crime Prevention Courtesy Cards to potential victims of crime. He has also contributed a great deal of time and talent working with our citizens to raise bicycle and pedestrian safety awareness. In carrying out his duties fairly and compassionately, Officer El Mehdaoui’s commitment to the community is unparalleled. On numerous occasions he has utilized his knowledge of the Arabic language to quell disturbances and aid the detective unit with sensitive investigations. Officer El Mehdaoui continuously displays a positive, professional attitude and goes out of his way to assist the members of his squad, regularly volunteering to take calls for the squad getting off duty. Time and again he has proven himself to be one of the department’s most valuable employees, embodying the department’s core values of Honor, Courage, and Commitment. 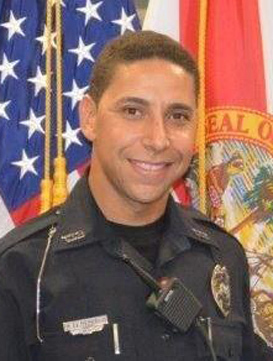 Officer Nabil El Mehdaoui is a two-year veteran of the Temple Terrace Police Department. He currently resides in Temple Terrace with his wife Sana and daughter Amani.